Elizabeth Garcia, right, rolls her eyes as she attempts to block anti rent control activists from Better Housing For Long Beach, as Allied community leaders and organizations came together in front of Long Beach City Hall, to release the first ever “People’s Budget Proposal” in anticipation of the Mayor and City Manager’s Fiscal Year 2019 budget proposals being released later this month.". Tuesday, July 17, 2018. It has been the battle of Who’s-Right? among researchers seeking a definitive answer to alleviate California’s seemingly non-stop housing crisis: How do we prevent displacement and is rent control an answer? 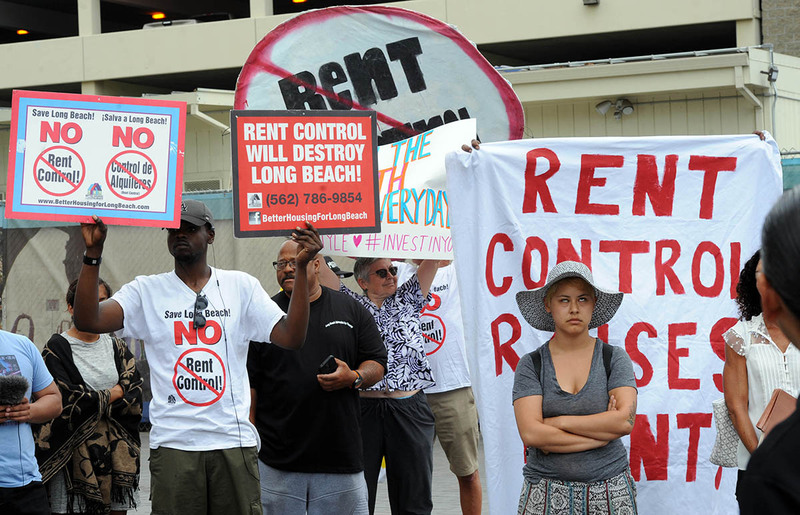 Within Long Beach, the hopes to have a local initiative ultimately failed (and even worse, speculation that the recent flurry of rent increases were prompted by property owners having to contend with rent control, flooding their bank accounts with extra cash despite the initiative never making it to the ballot). Shortly after two papers were released—one from Stanford economists, another from a UC Berkeley economist—arguing that rent control hinders accessibility to affordable units while exacerbating gentrification and displacement, another study has taken a closer into the immediate effects of rent control. And argues that these controls are desperately needed. Right now, the market is creating instability for renters: 54 percent of Californian renters—about 9.5 million residents—are rent-burdened, meaning that they spend 30 percent or more of their income on rent. That’s an alarming increase of over 3.4 million rent-burdened tenants since the year 2000. Then we have lack of proper wage compensation: 23 million jobs, or 73 percent of all jobs in California, do not provide enough compensation for workers to afford rent in the current market. Add onto this homelessness and you have a disaster: California leads the union with the highest homeless population—around 134,000 folks on any given night—of which it saw a 14 percent increase between 2016 and 2017 alone. All of these issues, not coincidentally, fall disproportionately on communities of color. With a lack of serious public housing funding, rent control may be one of the best, and cheapest, ways to protect low-income families. It can stabilize rents for existing tenants, improve affordability for tenants in the future, and preserve the existing affordability of housing that may otherwise become unaffordable, according to the study.